What do Chaka Khan, A Tribe Called Quest, Sybil, Angie Brown, Martin Degville, Darryl Pandy and a host of other less well known but undoubtably gifted performers, have in common? They have all at one time or another used the talents of this young man. After leaving performing arts college with a fist full of qualifications and a growing reputation as not just a singer, but a talented actor and dancer, Simon set his sights on persuing his passion for music. In 1990, Simon made the big move from the comfort and security of home in Manchester to London with it’s seemingly endless potential for a young singer. After joining several bands, playing legendary venues like th Jazz Cafe and Ronnie Scotts, aperaing on TV shows like The Word and 01 For London, it seemed the only way was up. Through the 90’s you could often find Simon in one of the open mike nights like the now legendary Singers at The Spot, or gigging with bands. He also got involved with the session scene and became rnowned for is unique vocal style and imaginitive backing vocal arrangements. In 1998 Simon signed a major publishing deal with Boosey & Hawkes, but as is often the case, a lack of vision, not to mention a management shake up at the publishers, left Simon out on his own. 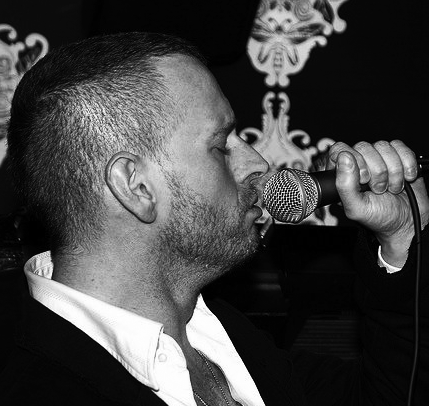 Not deterred, Simon set about honing his craft, working hard and all the while performing at venues all over the world as part of SPACE UK, one of the uk’s premier party band, or supporting house legend Angie Brown on many a late night in a heaving club. All this experience was to shape the performer that Simon has become. It was at this time that Simon first met Richard Earnshaw and Mark Horwood and became part of Fusion Groove Orchestra, whos first release The Dream, a slice of pure funk, has gone on to become a firm favorite with house junkies the world over. This was to become a partneship that has endured and in 2005 formed The Little Big Band with Matt Grey, After the amazing response to thir first reaeases If You Don’t Know Me By Now and Pressure, they have been working hard on finishing their debut album that should be available in the late spring. In 2007, simon signed a new publishing deal with Duffnote and saw the release of Had Enough with DJ Circle and a cover of the Bobby Caldwell soul classic Do For Love and Keep Me Comin Back with Central Avenue, both featured on some cool compilations. September 2008 saw the release of If You Remain, a new track with ROED SVENSK, out on REELGROOVE, with some fantastic mixes by DOLLS COMBES, CENTRAL AVENUE and PARK STREET. In 2010 Simon cemented a long standing working relationship with UK House Legend ANGIE BROWN, collaborating with artists and producers worldwide, including HOXTON WHORES, SCOTT LANGLEY, PETER GELDERBLOM, EMPIRE ST8 MARTIN WRIGHT, DANNY HOWARD (winner of RADIO 1’s SUPERSTAR DJ COMPETITION), RACHEL ELLEKTRA, KID SHAKERS, GLASSES BOYS and CARL HANAGHAN & MY DIGITAL ENEMY. This year also saw Simon go on the road with RICHARD EARNSHAW, to promote the release of his eagerly awaited ‘In Time’ album, staring with the launch at THE JAZZ CAFE which also featured the amazing KENNY THOMAS, NATASHA WATTS AND NATASHA YOUNG. 2011 saw the release of the first Green/Brown collaborations, Including ‘Exceptional’ with PETER GELDERBLOM, ‘Jump to It’ with KID SHAKERS and ‘Put Your Hands On Me’ with CARL HANAGHAN & MY DIGITAL ENEMY, released on ROGER SANCHEZ’S label STEALTH RECORDS. ‘Pressure’, the 2006 release from THE LITTLE BIG BAND works it’s magic on HED KANDI – DISCO HEAVEN 2011. 2012 sees the release of ‘I’m in Love’ with DOLLS COMBERS and ‘Freedom’ with ANGIE BROWN & MARTIN WRIGHT and the first release track from the forthcoming LITTLE BIG BAND album.